Since 2013, the Juan de Fuca Community Trails Society has led a guided Recreational Hiking Program sponsored by the Juan de Fuca Parks and Recreation Commission to encourage residents and visitors alike to get out and enjoy the incredible wilderness of our area. The hikes focus on the Sooke Hills and the Sea to Sea Green/Blue Belt and are led by experienced members of the Community Trails Society who are trained in navigation and first aid. Their knowledge of each trail will enhance your enjoyment and understanding of the area you are hiking through. Hikes are appropriate to the season in which they are offered. Winter hikes are shorter and closer to civilization while Spring hikes feature trails in the Sooke Hills where wildflowers are abundant. Summer and Fall hikes are for reasonably fit hikers wanting a more extensive experience in the woods. Check out our latest brochure for additional information. 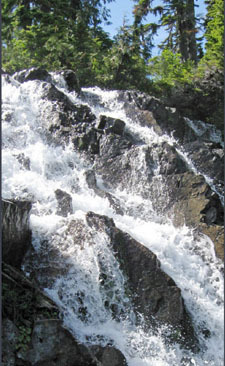 Hikes are free but a donation to the Juan de Fuca Community Trails Society is appreciated. WHEN: Hikes are the 2nd Saturday of each month. HIKE: Most hikes follows a variety of single track trails. Please note that some of the hikes are on lesser used trails - at times the footing requires care because of loose rock on slopes. On joining the hike you will be asked to sign a liability waiver. Hikes are listed on our Upcoming Events page.